It’s that time of year when we heading west to CalgaryExpo. If you’re in the Calgary area, come and say hello and see what we have to offer. Ask us the perennial question: what happens next? You’ll find us at our usual table, D06 in the BMO Centre Halls ABC. We’ll have a new edition of Book 1 and 2 that wraps all of the comic goodness of Book 1 and Book 2 into one tidy volume, available for $10. We’ll also have some fresh original art pieces and some new prints too. New this year, watercolours! Depending on what you would like commissioned, we will either finish them at the show, or they’ll be sent to you after the show. Finally, keep an eye our for our piece in the 2016 Calgary Expo Charity Artbook themed “Fairy Tales & Classic Monsters”. It features creations by artists attending the 2016 Calgary Expo with the proceeds going to local charities. The book will be available at Expo Store locations in both the BMO (Halls D&E) and the new additional location in the upper Big Four building. See you on the show floor! 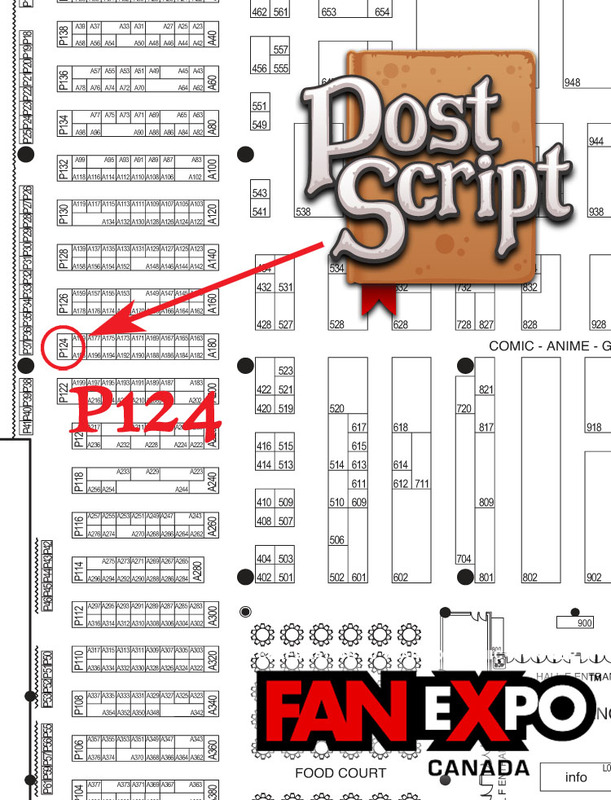 We’ll be at Toronto’s FanExpo again this year. Stop by to complete your PostScript collection, pick up some original artwork, commission some new artwork or just to say hi.